When I was working in Schiphol-Rijk a few years ago, I would occasionally cross the Aalsmeerderbrug to Aalsmeer to fill up at a conveniently located petrol station. 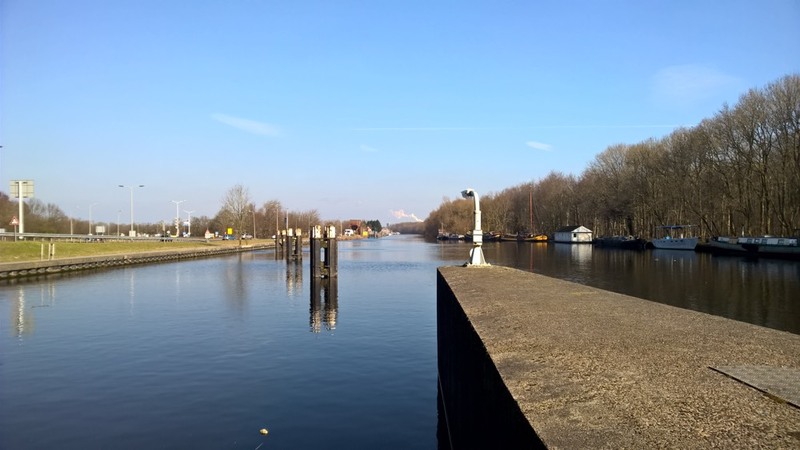 More recently I’ve been shuttling Alex to appointments in Amstelveen, which has had us crossing the same waterway on the A9 a few kilometers further north. The route along the dyke always looked quite attractive, and I put it on my long-walk list. Last weekend the weather was gorgeous — cold, but sunny and clear — and I got up early on the Sunday to give it a go. I didn’t want to spend the first few hours just walking to the start of my walk, so I took the first bus from Oostzaan to Amsterdam Centraal (08:30), and then a tram to the Olympic Stadium. From there I followed the path around the north shore of the Nieuwe Meer. 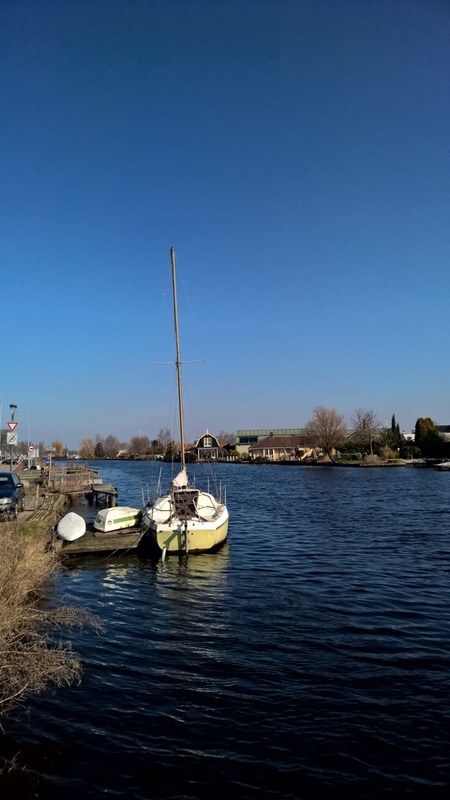 I crossed the water on the Oude Haagseweg and continued on the Nieuwemeerdijk. That took me as far south as the A9, and to the north-western corner of Schiphol. The road wandered through the Sunday-deserted office and light industrial parks of Schiphol. Past the N231 the dyke became the Schipholdijk, and I could walk alongside the water again. A couple of kilometers later the road became the Aalsmeerderdijk, and later the Leimuiderdijk. 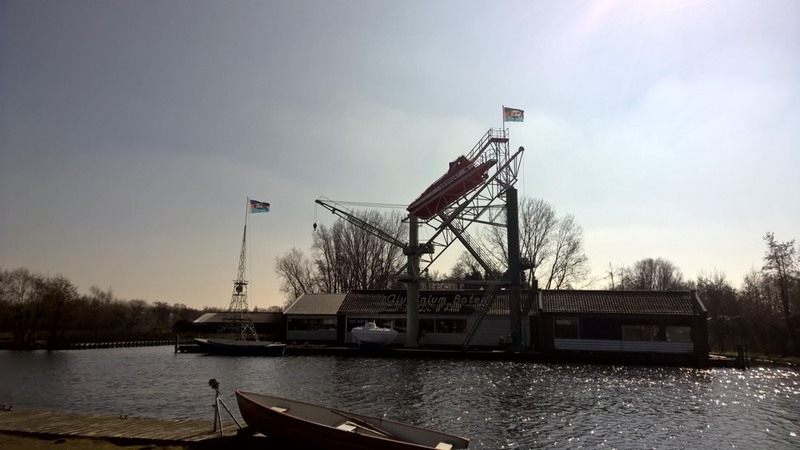 I walked past the Westeinderplassen as far as the Leimuiderbrug, at which point I got bored. I had intended to keep going to Sassenheim and take the train back, but there were other things I wanted to do that afternoon. 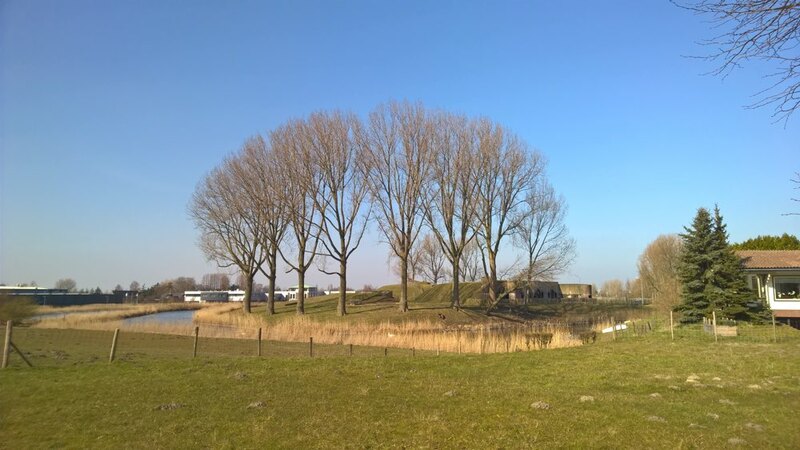 So I turned back to Burgerveen, and cut along the Venneperweg to Nieuw Vennep and caught the train there. 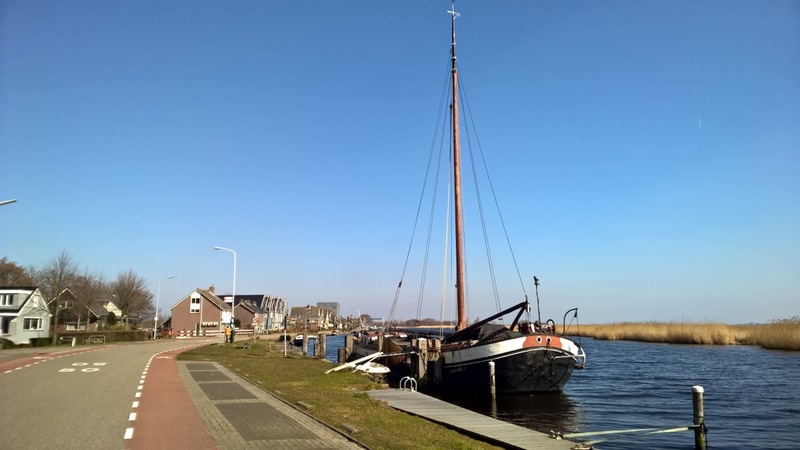 (Nieuw Vennep -> HoofdDorp -> Zaandam -> Oostzaan) Total walking distance about 25km. It was a nice walk, and some parts of the dyke are lovely, but it wasn’t as idyllic and charming as I’d pictured. It was also about five hours straight into the sun, and I hadn’t even considered bringing sun block. Bad move. I got a serious burn on my face, and most of the last week it has either been painful or flaking off. Note to self: do better. 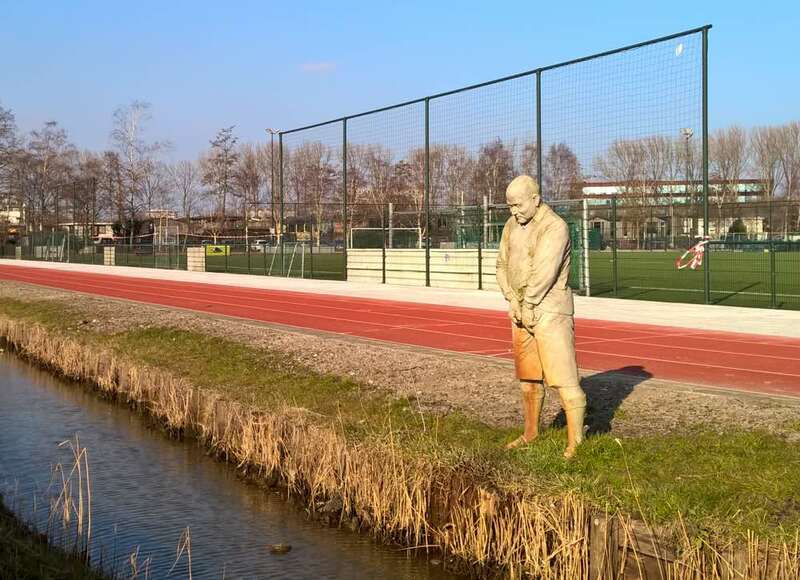 Statue of a dude taking a piss in the canal. With working water spray. Dutch public art: don’t ever go changing. 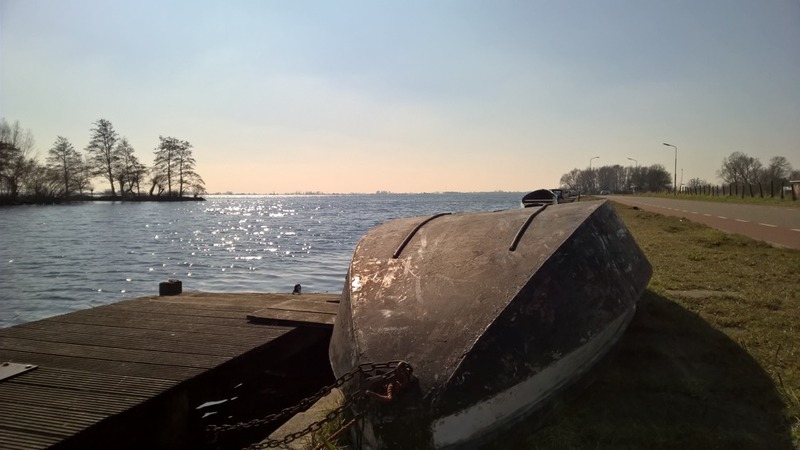 Just off the Anton Schleperspad on the west side of the Nieuwe Meer. 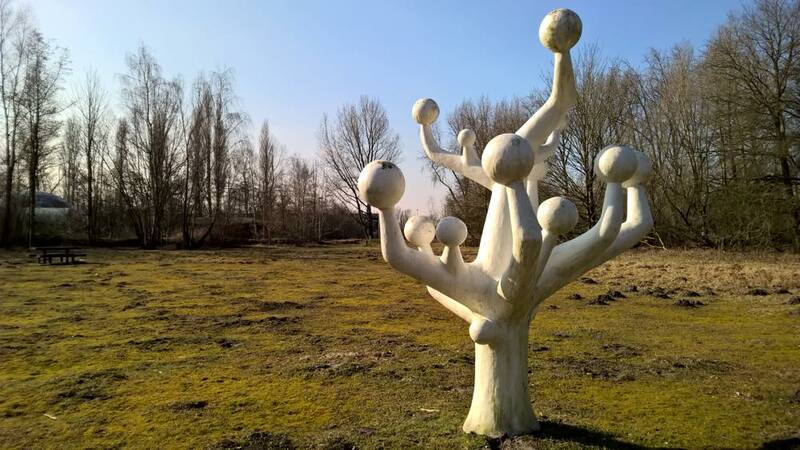 Dutch public art, don’t ever etc. Verhoef Aluiminium Boten. Drop-tested? Also miniature aluminium Eiffel Tower. Transparent tiles on the home screen! I’m disproportionately excited about this. There’s a setting to wake up the phone by double-tapping the screen! My old Nokia N9 used to have this, too! Again, excited. Word recognition in the swipe keyboard has gone to crap. I’m sure there’s more, I just haven’t noticed it yet. Bear in mind that I have a very superficial relationship with my phone. My Mac (using OSX El Capitan) still doesn’t recognize the phone in Image Capture. The Camera Upload feature in the Dropbox app for Windows Phone still doesn’t support uploading video. The Nokia Photo Transfer app is annoying. Rather than trying to force the Lumia into my old workflow for gathering photos, I’ve given up and am using Microsoft’s preferred option: OneDrive. 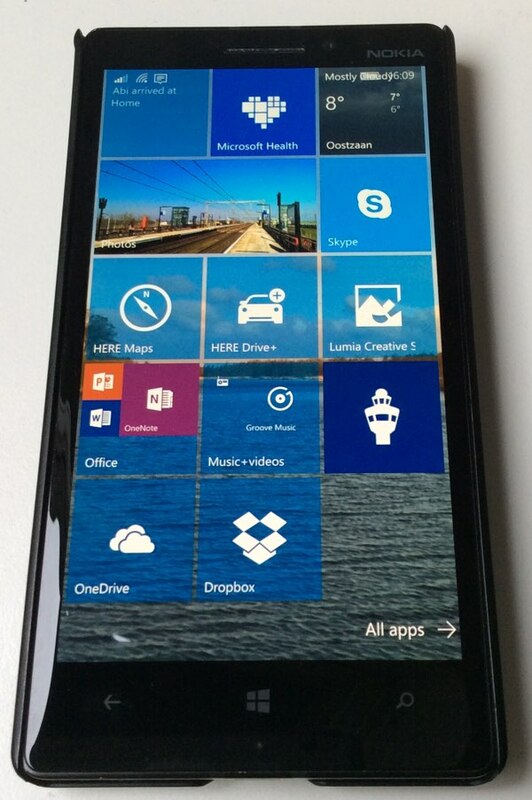 When I take a picture on the Lumia, it gets uploaded to my Camera Roll in OneDrive. I’ve installed the OneDrive app on my Mac, and it automatically syncs the remote changes to my local hard disk. How many syllables in “squirrel”? Huh, I thought. “Squirrel You Know It’s True” sounds like a play on Milli Vanilli’s 1989 hit “Girl You Know It’s True”. It’s pretty close, but it would be better if “squirrel” sounded more like…OH WAIT. 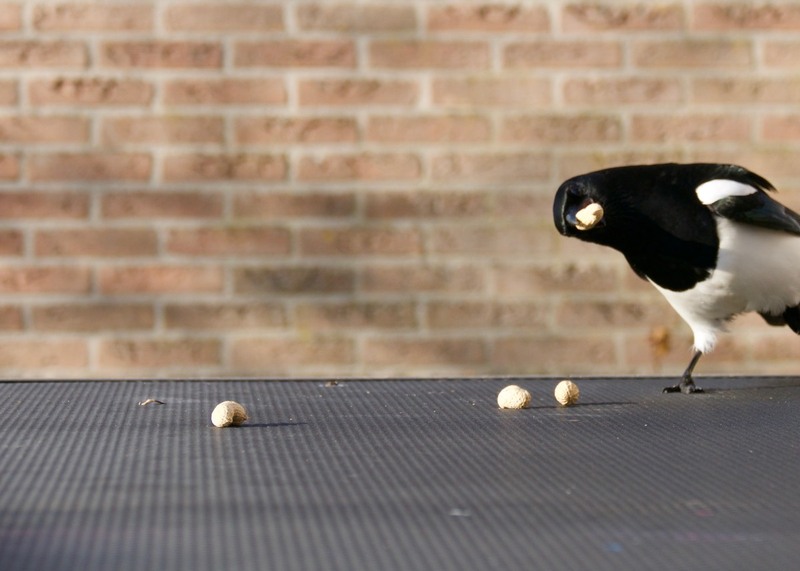 I pronounce “squirrel” with two syllables, but some people pronounce it with only one, to rhyme with “pearl” or “twirl”1, and if you do that then it’s a perfect piece of wordplay. 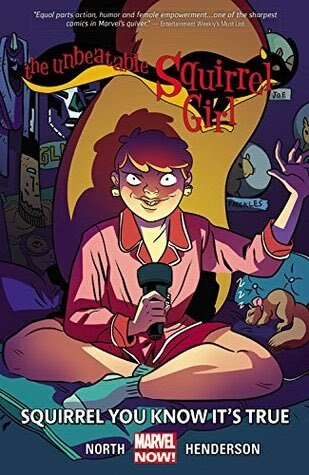 In fact, the name “Squirrel Girl” becomes a rhyme in itself! And the subtitle of volume 1, “Squirrel Power” makes much more sense now too! I’m going to have to go re-read it to see what else I missed. 1 Of course, in some Scottish accents the words “pearl” and “twirl” don’t rhyme with each other, and are pronounced with two syllables. And sometimes the word “girl” is pronounced as “gurrull”. (Epenthesis.) Actually, that makes “squirrel gurrull” rhyme again. Huh. A short leet is used to describe a list of selected candidates for a job or an office which has been compiled from a longer list. Thus, the list of candidates most likely to get the job is a short leet. This is a good place for job-hunters to be unless all the other names on the list belong to relatives of board members. Leet was first recorded in Scots in the sixteenth century In the late eighteenth and early nineteenth centuries, a short leet was applied specifically to a short list of nominees for the seats of the retiring members of a burgh council. This short leet was a culled version of the original, much longer, list of nominees for these posts, the longer list being known as a long leet. It was the reduced list, or short leet, which formed the basis of the voting. Leet could also be a verb and meant to put a candidate’s name on a select list. A quick google search shows that the phrase is still in use, but only in Scotland. And even so, it’s not very common. The reason I thought about it is because I’m working on my occasionally-annual-and-rarely-timely Radio Sunpig playlist for 2015. iTunes used to make it easy for me to compile my short leet, because since 2005 I had used a fairly rigorous classification scheme for rating songs that I downloaded and listened to. The short leet was basically the list of 5 star songs from each year. I use Spotify instead of iTunes now, and Spotify doesn’t have granular options for rating songs. 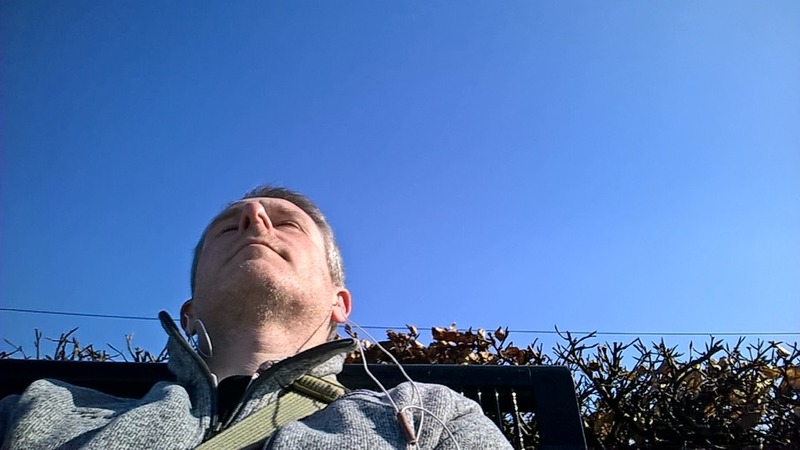 So I’m having to use a combination of Spotify’s playlists (junk), Last.fm’s listening history (actually very good), and my own Mixed Media posts here on sunpig.com to help me out. I’m annoyed at iTunes because Spotify doesn’t have ratings. See how that works? Anyway, Radio Sunpig 2015 incoming soon. Some great songs last year. On Tuesday morning I happened to tune in to Zane Lowe’s show exactly at the moment when he plugged Lizzo’s new single, “Good As Hell”. It’s fantastic. 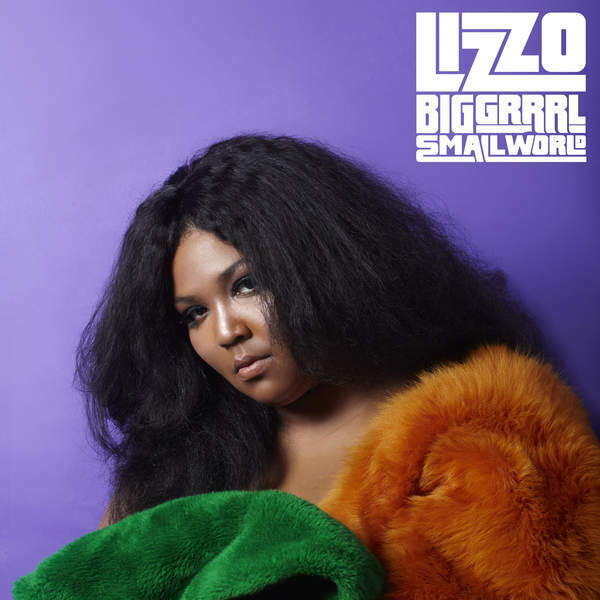 I had missed the release of her second album, Big GRRRL Small World in December, so I’ve been catching up on it this week. It’s more laid back, and features more of her singing than rapping. It doesn’t have as many immediately catchy tracks as Lizzobangers, but it is growing on me. Deadpool: I watched this on my own because it’s a 16 certificate, and Pathe cinemas don’t allow under-16s in for those even if they’re accompanied by an adult. Honestly, there was nothing in Deadpool that I would have minded Alex or Fiona seeing, but that probably just says as much about me as a parent. It’s an irreventant and fresh take on the current superhero movie era. Apart from the long flashback, it’s a straightforward revenge story. Ryan Reynolds was born to play Deadpool, but we all knew that. Zootopia is one that Fiona and I did go to see together. Non-essential, but fun. Creed is amazing. Great story that echoes but doesn’t ape the original Rocky. Intense performances from Sylvester Stallone and Michael B. Jordan, and some very clever editing and effects around the fight scenes. Loved it. Want to go back and watch Rocky again now. I’m up to the middle of season 9 of Criminal Minds now. After the highs of season 7, season 8 was weaker. The villains were less inventive and less sympathetic, the recurring plot elements (especially the cognitive interviews) felt repetitive and predictable, and the opportunity offered by the introduction of a new team member (Dr Alex Blake) was wasted. Apart from her history with Erin Strauss, she was blandly functional. Netflix NL made season 5 of The Walking Dead available the other week, and I’ve just finished watching all of it. Season 6 is still airing on TV, so I guess I’ve got a while before I can catch up to it. Over the voorjaarsvakantie the other week I played Firewatch by Campo Santo games. It’s an ambitious dialogue-based game that is hard to talk about without spoilers. The graphics are stunningly beautiful, but marred by disruptive drops in framerate when the PS4 failes to keep up. The story veers from tense thriller to painfully emotional drama in the blink of an eye. The character dialogue is outstanding. The radio chats between Henry and Delilah are intimate, funny, and show a complex friendship developing. You feel part of the relationship. But I didn’t like the ending. The game tries to sell you one thing, and it delivers another. The thing it delivers isn’t a satisfying pay-off for the atmosphere the game spends several hours developing. I can see what they were trying to do. Ultimately, I don’t think it worked, but I applaud the attempt, and I would love to see more games like this. I’m on part-time leave this week, and I’m doing a bunch of scanning and archiving. Mostly paper documents that have been accumulating in hanging folders for the last ten years. I’m finding the app PDFScanner to be invaluable. It makes it super easy to scan a batch of sheets, do OCR on the text, and save them as a single searchable PDF. The process would be a lot faster if I had a proper document scanner, but I’m making do with the Epson Perfection V600 flatbed I bought a couple of years ago. Once I’ve done the initial bulk scan, I’m not going to be scanning dozens of documents a day. It’s fine. Every day, throw something away. Just because you have it, doesn’t mean you have to use it, or even keep it. This is all building up to one day being able to finish organizing and digitizing our boxes of 35mm photos and prints. Despite what I thought at the time, the APS format has one key advantage over 35mm in the digital era: it’s easy to ship a small box of APS camera rolls to a third party for scanning. Our 35mm negatives and prints are all over the place. It’s going to take some effort to gather them all together for sending them out in the first place. I don’t have that in me yet. 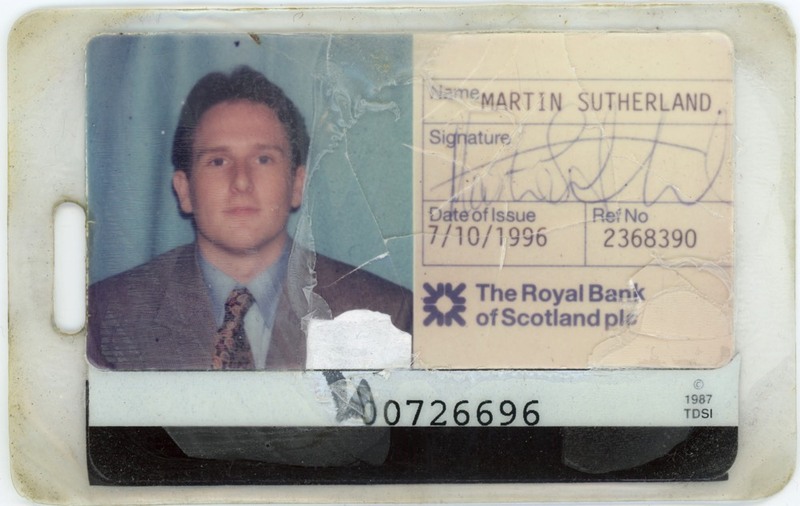 In the meantime, I did come across and individually scan a couple of relics from the 1990s: my first RBS security pass from when I started work there in 1996, and a souvenir business card for my character Beck from Ambercon UK back in…1995? Might have been 1996. Either way, some 20-ish years ago. I remember reading about AmberCon UK while I was working as a clerical assistant at the HCRC (Human Communication Research Centre) in early 1994. (Surfing usenet in my lunch hours, in a terminal window on a pizza box Mac LC.) I think we went to the one in 94. I’m not sure if that’s when I first played Beck, though. 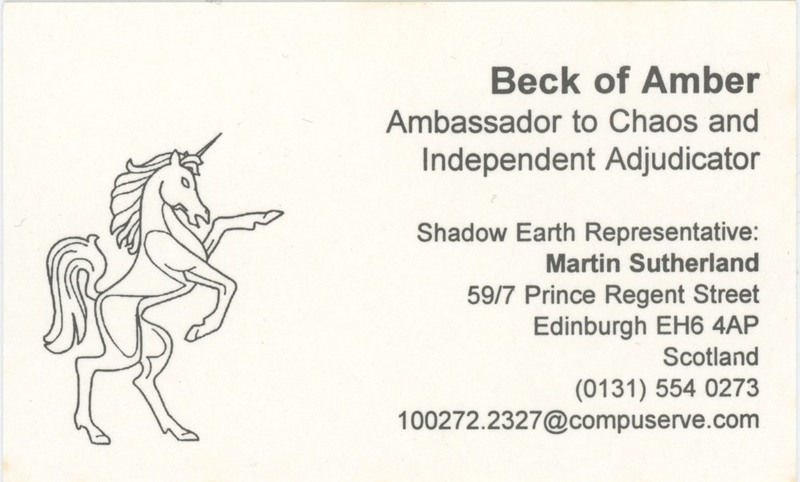 The business card would have been a souvenir for the con after the first time I played him, and brought him back as a recurring character. So either 95 or 96. PS: I also found myself describing to Fiona this afternoon what a “photo negative” is.